This post has been sponsored by the DINTY MOORE® Brand. All thoughts and opinions are my own. Camping with kids can be a lot of fun, but it can also be a LOT of work. Especially when you think about all the food that you have to pack and make in order to get there. I learned a long time ago that getting the kids involved in the cooking process helps relieve me of some of the work AND it’s actually fun for all of us! We find that when we eat together around the campfire, we come away with more fun memories to hang on to and to talk about in the future. 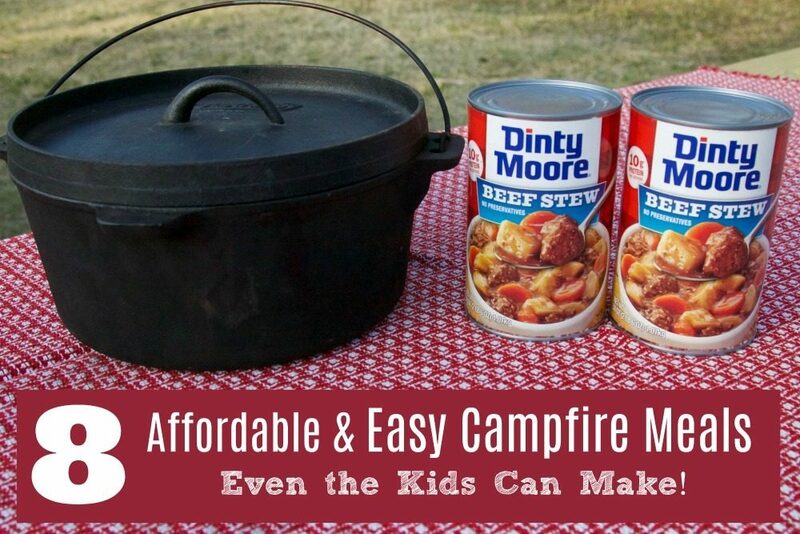 We’ll say things like, “Remember when dad cooked that can of DINTY MOORE® Beef Stew over the campfire without using a pan”? And then we all get a good laugh of how fun that was, eating that hot Beef Stew, right from the can! 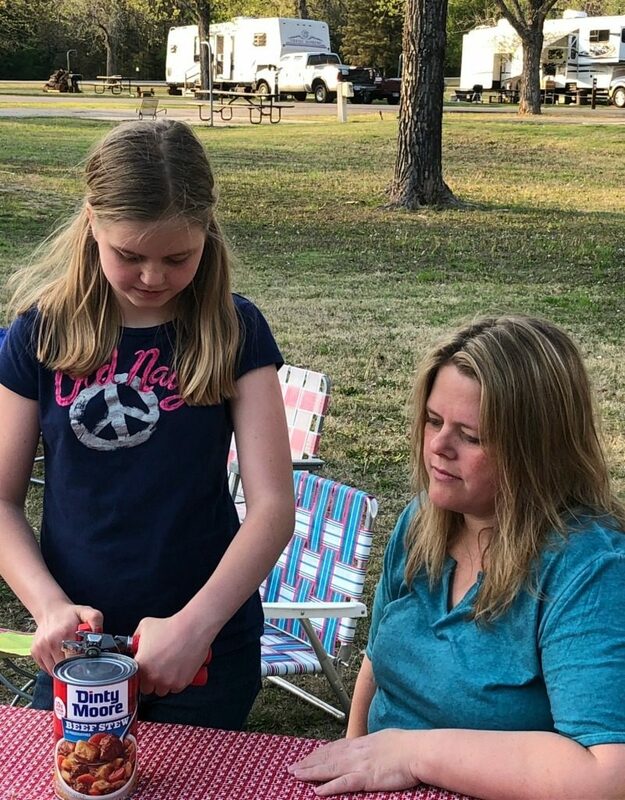 Today, I have several fun ideas of how YOU can get your kids helping out when it comes to eating supper around the campfire! 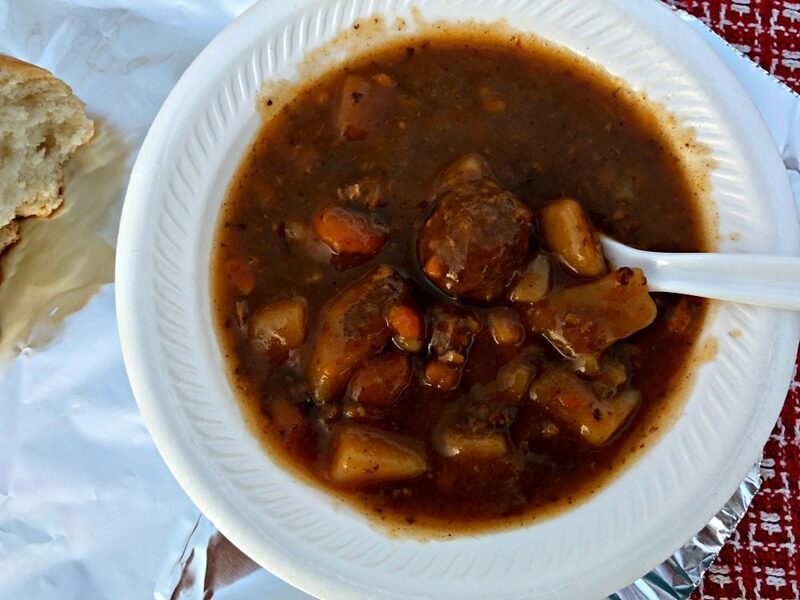 DINTY MOORE® Beef Stew & Italian Bread – This is one of those meals that we almost always make while we’re camping, because it’s the least amount of work compared to all of the our other options below. Plus, it has real meat, potatoes and vegetables. We have a cast iron dutch oven and a cast iron skillet that we take along with us. 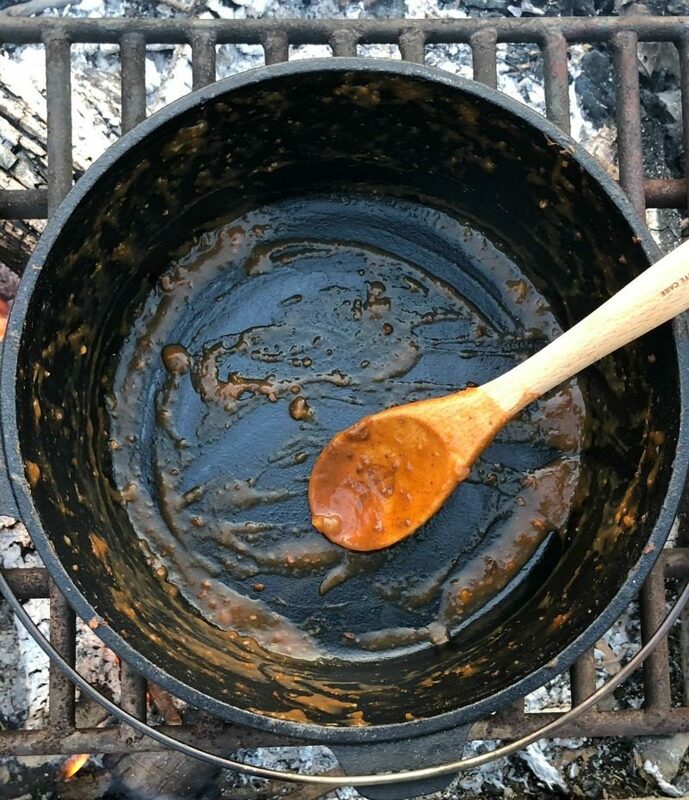 As I mentioned before, my husband will sometimes cook it in the can over the fire, but… when we want help from the kids or we have a larger batch to cook, we’ll have them put it in the dutch oven and keep watch over it until it’s good and warm. We also buy a $1 loaf of Italian bread from the bakery and wrap it in foil and put it next to the dutch oven to warm over the fire, as well. It’s so easy to pack in our camping gear and so tasty! Sandwiches – We always keep lunch meat, cheese, peanut butter, jelly and chips on hand so that we always have a meal available at a moment’s notice. You never know when someone will get hangry. (You know, so hungry that you’re angry. lol). Too much play can make one grumpy fast, if they’re hungry! Roasted Hot Dogs Over the Fire – This is the one everyone thinks of when it comes to camping. It’s typically something that we do every trip out camping, just for the experience of it. BUT, I often like to dress it up. Since we’re normally camping in our camper, I often bring along some chili, sauerkraut and other hot dog fixings to make a better than plain hot dog. Pigs in a Blanket – This is another fun way to dress up your hot dogs. Bring along a can of crescent rolls and wrap one around each hot dog and then poke the whole thing with your skewer, so that the dough and the hot dog won’t fall off. Cook until the dough is cooked all the way through. YUM! Foil Packet Calzones – Bring some refrigerated biscuit dough and some pizza sauce, cheese and any pizza toppings you’d like. Have the kids spread out their dough on a paper plate, put a dab of pizza sauce and whatever toppings they want, then fold over their dough and seal it. Place it in a foil packet and roast it over the fire. You will have to help them get it in and out of the fire, unless they’re older of course, but the rest is in their court! Foil Packet Meals – You can come up with any variety of meals with foil. 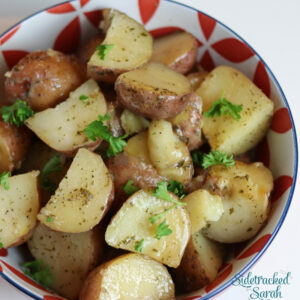 We have made potatoes, hobo packets, santa fe chicken packets, lemon chicken and asparagus… and more. The fun thing is, you can let the kids mix and match what they put in their packet to suit their tastes. Don’t forget the seasoning! 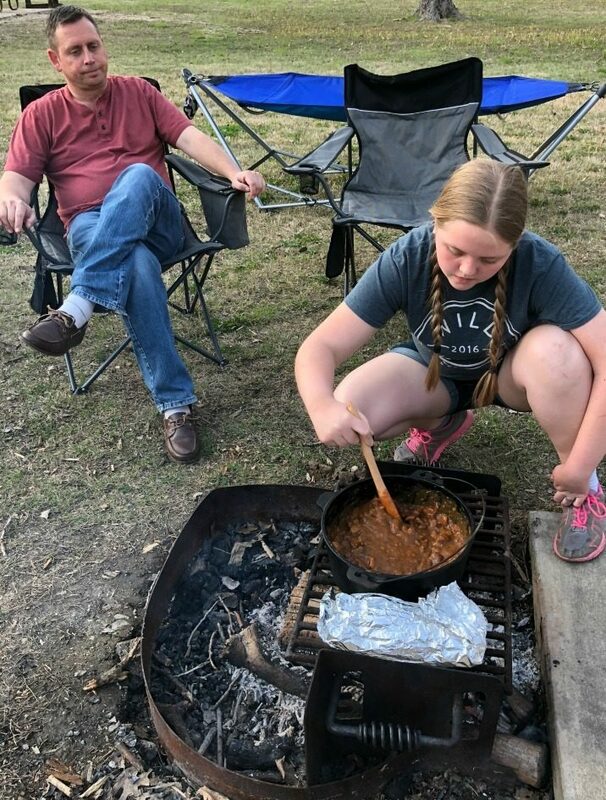 You can supervise putting them on the grates or in the fire… OR if you don’t want to mess with the fire, you can always just put them in your slow cooker (if you’re in an electric camp site). We typically camp in a camper, so we always have electricity, too, but we like to experience the foods of camping. S’more Cones – This isn’t exactly a meal, but it’s a very FUN dessert! Put your favorite S’mores toppings in a waffle cone, wrap it in foil and put on the grate over the fire until all the toppings melt together. 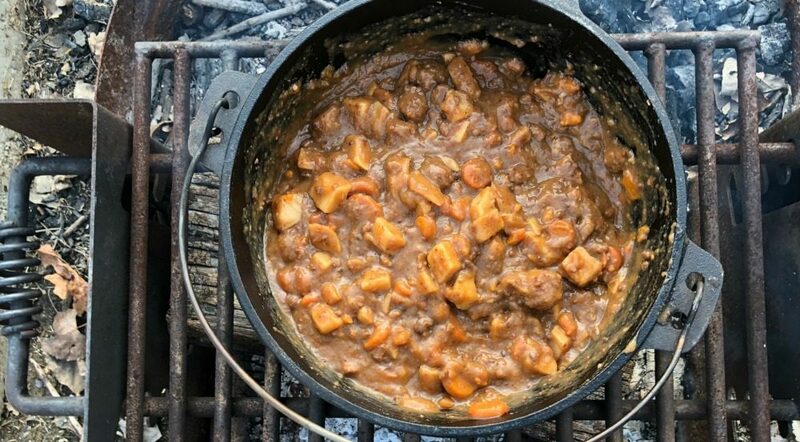 Our family of 8, made 3 of the large sized DINTY MOORE® Beef Stew cans for one whole camping dinner and we all had plenty. Of course, we ALMOST licked the pan clean. Almost. 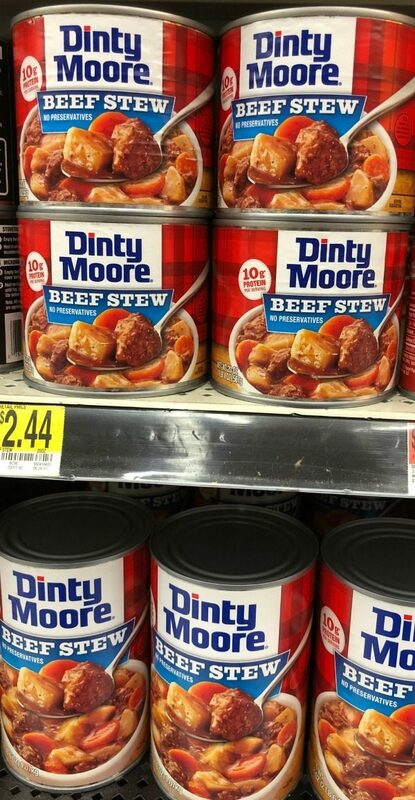 To purchase DINTY MOORE® Beef Stew for your next camping trip, you can find it at your local grocery store. (We found ours in the canned meat aisle.) And if you want some extra rebate savings on the product, click here! Read the Whole Bible in 90 Days?